Last year, your tap water met all EPA and State drinking water health standards. We are proud to report that Charlevoix Township has not violated any state or federal water quality standards. This information is a snapshot of the quality of the water that we provided to you in 2016. Included are details about where your water comes from, what it contains, and how it compares to Environmental Protection Agency (EPA) and state standards. For more information about your water, call 547-4611. Your water comes from eleven groundwater wells located in five locations around town; near south elevated tank, near the airport, near the north elevated tank, and near country club. The State preformed an assessment of our source water in 2003 to determine the susceptibility or the relative potential of contamination. 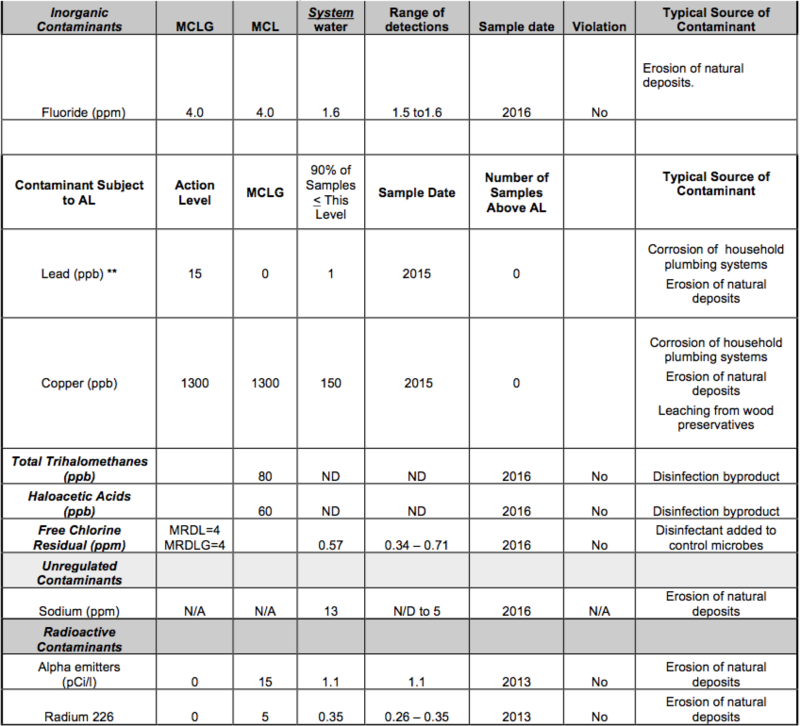 The susceptibility rating is on a six-tiered scale from “very-low” to “high” based primarily on geologic sensitivity, water chemistry and contaminant source. The susceptibility of our source is “Moderately Low “for North side system and “Low” for south side system. Cryptosporidium and other microbial contaminants are available from the Safe Drinking Water Hotline (800-426-4791). Sources of Drinking Water: The sources of drinking water (both tap water and bottled water) include rivers, lakes, streams, ponds, reservoirs, springs, and wells. Our water comes from wells. As water travels over the surface of the land or through the ground, it dissolves naturally- occurring minerals and, in some cases, radioactive material, and can pick up substances resulting from the presence of animals or from human activity. Radioactive contaminants, which are naturally occurring. In order to ensure that tap water is safe to drink, EPA prescribes regulations, which limit the amount of certain contaminants in water provided by public water systems. We treat our water in accordance with these regulations. Food and Drug Administration regulations establish limits for contaminants in bottled water, which provide the same protection for public health. 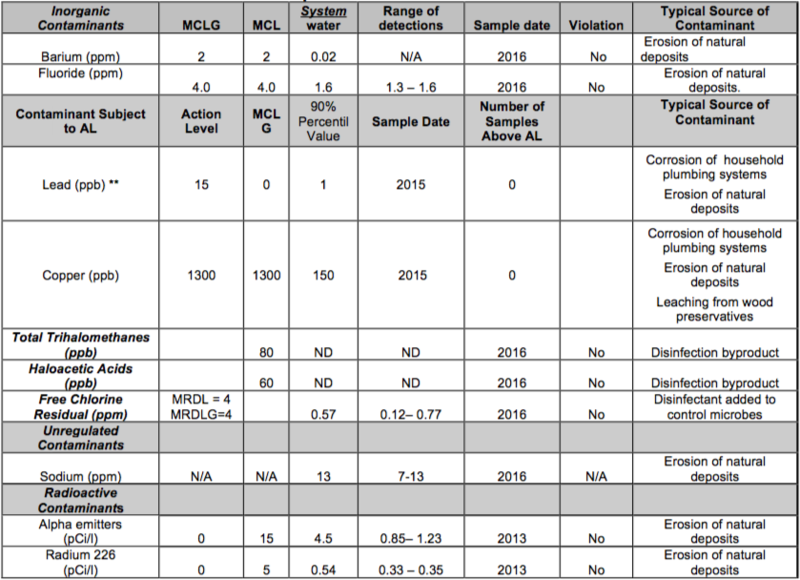 The tables below list all the drinking water contaminants that we detected during the 2016 calendar year. The presence of these contaminants in the water does not necessarily indicate that the water poses a health risk. Unless otherwise noted, the data presented in this table is from testing done January 1 – December 31, 2016. The State allows us to monitor for certain contaminants less than once per year because the concentrations of these contaminants are not expected to vary significantly from year to year. All of the data is representative of the water quality, but some is more than one year old. Information about lead: If present, elevated levels of lead can cause serious health problems, especially for pregnant women and young children. Lead in drinking water is primarily from materials and components associated with service lines and home plumbing. Charlevoix Township is responsible for providing high-quality drinking water, but cannot control the variety of materials used in plumbing components. When your water has been sitting for several hours, you can minimize the potential for lead exposure by flushing your tap for 30 seconds to 2 minutes before using water for drinking or cooking. If you are concerned about lead in your water, you may wish to have your water tested. Information on lead in drinking water, testing methods, and steps you can take to minimize exposure is available from the Safe Drinking Water Hotline 1-800-426-4791 or at http://www.epa.gov/safewater/lead. We are committed to providing you safe, reliable, and healthy water. We are pleased to provide you with this information to keep you fully informed about your water. We will be updating this report annually, and will also keep you informed of any problems that may occur throughout the year, as they happen.